Lostpedia Blog: Is it immature to moan? Anyway a point they raised got me thinking about some of the stuff we've had over the past few weeks, and in particular attitudes towards the slow progression of our little ARG narrative. I also ran a little poll on Lostpedia wiki about attitudes towards the game so far, and was pleasantly surprised to see that, mostly, attitudes were either positive or optimistic for improvement in the coming weeks. This was an impression that honestly I hadn't felt from the involvement and interaction I've had with other people, on sites such as Dark, Doc, LostARGs, Lostpedia - all the "key" sites (however you wanna take that). Indeed, I saw Congested's perfectly valid arguments at Dark's blog, where he complained about a lack of narrative. I agree with this really, I'd like to see a clue that actually leads to some plot development as opposed to a clue that leads to a test or another clue - it feels like the end result is nothing useful, just a further distraction from something important. I would love a clue that actually has significance to something relating to this story or Lost itself. 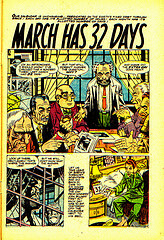 The March Has 32 Days thing was a great example - its Lost parallels are fantastic. More like this? However, the real point I want to ask though is this - are those fans that are "moaning" (using the term in a completely unbiased sense) justified, or are we all just being Season 1 Shannons? I hear the argument a lot "well you know we are getting this completely for free - be grateful!" - but is that fair? I mean, this ARG isn't necessarily the angle of "giving something back to fans", surely its "keeping their interest so they haven't deserted us by January". In that sense, there seems perfectly valid arguments on both sides. I have to say I'm personally on the fence, as yes I would love to see more clues, but I am appreciative that we have at least something to keep interest and the community active, whether or not I agree with it in terms of its actual STORYTELLING value. Thus, maybe it is the case that attitudes should be more in defense of TPTB, as if you scratch off all the semantics and get to the true core - it is, reluctantly I guess for some people to admit, a case of anything being better than nothing. I think this ARG was mistakenly marketed as being like TLE, when clearly it is not - following a similar format to Find 815. Which is fine, but it wasn't specified, and so now there is a lot of judgment of the way this story is going, comparing it to the wrong standard. Should we be following with more patience and optimism? Well the Lostpedia poll, as I mentioned, seems to think so.